After my last blog post on how I developed my interest in history, it only seems fitting that I talk about what actual topics in history appeals to me the most, and how my interest developed! When people first hear that my favorite president is Abraham Lincoln I get a look that clearly says ‘oh how stereotypical.’ Not that I don’t understand why. Lincoln might very well be THE most famous president, up there with the likes of Washington, Roosevelt and Kennedy. But while I do think he was a great president for believing in the fight to keep the nation together, for supporting freedom for slaves and for making powerful speeches, those aren’t the key reasons as to why I like Abraham Lincoln so much. I like Abraham Lincoln not for his successes, but for his struggles. More specifically, his struggles with depression. My AP American History teacher assigned my class to write a research paper on any topic of our choice, and initially I had no idea what I wanted to do. While American history was interesting for me, there wasn’t one single topic that I felt a need to research more in-depth. I went to my teacher, and after talking to him about my interests, he strongly suggested I look into Lincoln’s struggle with depression, as he had just read an interesting article on the subject and thought I would like it. After an hour looking into it, I was hooked. Lincoln wasn’t just depressed at times, he struggled with the illness over many years of his life, having three breakdowns, one of which occurred during his time in office. But instead of succumbing to his illness, he rose above it. He developing coping mechanisms, such as writing, and developed a mindset that made him unique. Lincoln himself also mentioned that he felt as though the best cure for his sadness was to avoid free time, inspiring him to work often. His view point on life changed also, as he developed an obsession with making a change in the world, proving that his time on Earth had meaning. Lincoln constantly worked in order to better himself, and ended up developing self-understanding, discipline, and strategies for advancement that would ultimately shape his character as a person. I am so grateful that my teacher recommended this subject, as well as the book by Joshua Wolf Shenk, “Lincoln’s Melancholy,” which I found to be so interesting I purchased it for my own enjoyment. Abraham Lincoln would probably be my favorite person in history due to his struggles, and how he overcame his struggles to modify the course of history. Before last summer I had no real interest in Zelda Fitzgerald. I had seen “Midnight in Paris,” and found her character intriguing, but I didn’t take the time to explore more about her. 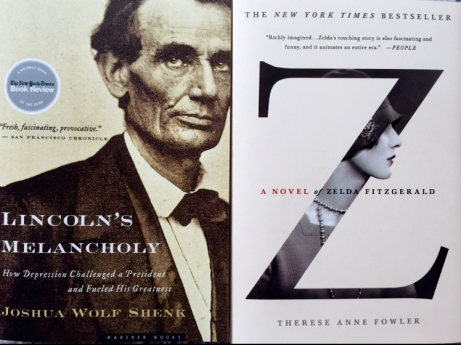 Nor had F. Scott Fitzgerald truly appealed to me, even though I had read and enjoyed “The Great Gatsby.” I frequented Barnes & Nobles however, and kept seeing the book “Z: A Novel of Zelda Fitzgerald” by Therese Anne Fowler on display, and after passing it one too many times I bought it. I’m not sure what compelled me to buy it exactly, but I think it was the way Fowler described Zelda in the back summary of the book. Fowler makes Zelda appear as a mystery, a woman that was seemingly known by all but in reality known truly by none. She was a prominent figure of society, and while many loved and adored her, she had her own secret demons. Picking up that book was one of the best decisions I made when it comes to books in quite a while. It was absolutely magnificent. For starters, it’s written entirely in first person, as though you are gaining insight from Zelda herself. On top of that, the general story of Zelda’s life was so much richer than I was expecting. She traveled like I only dream of, she lived life to the fullest, but at the same time she was battling expectations, from society, from her husband, and from herself, expectations she at times was unable to meet. Reading about Zelda Fitzgerald makes me want to take a no prisoners approach to life. She inspires me to try new things and to take risks, because even if they take a turn for the worse, at least you will be able to say you did all you could. From a reader’s perspective, she also makes me want to explore history about people that had influence on others that impacted society. While F. Scott is more well known than Zelda, she at times shaped him into the man he became. Knowing how she was able to impact so much from the sidelines makes me hungry to learn about others like her, people who impacted history without necessarily being the ones getting the full credit. It should come as no surprise that I am interested in the Civil War if I have a strong interest in Abraham Lincoln. But while the average person interested in the Civil War is interested in the battles of it, I’m more interested in what led up to it. Ever since we declared our independence, we have been slowly but surely building up to the Civil War. Most people believe that the Civil War was fought due to slavery, but it runs much deeper than that. The Missouri Compromise, where the line of slavery vs. non-slavery states is an example of something that started the ball rolling, and the Dred Scott ruling, which overturned the Compromise, only helped to bring us closer to the Civil War. Other events and works, such as Harriet Beecher Stowe’s “Uncle Tom’s Cabin,” the Harper’s Ferry raid, and the abolitionist movement also helped bring the nation to war. I don’t particularly find the battles interesting, because to me they are just that: battles. They have strategy yes, but what I find truly intriguing is what made us have to fight them. I find it incredible fascinating how something like a novel can impact society so much that it helps instigate a war. That’s why the causes of wars are so much more interesting to me than the wars themselves. When I was thinking about social movements walking into my American history class, all I could really talk about was the 1970s movements, those which concerned civil rights, women’s rights, environmental concerns, and anti-war protests. And even then I didn’t know much about them. Yet I had always found social movements to be just as interesting, if not more interesting than the major events and wars that shaped our country. Maybe it has to do with my marketing interest, as society’s changes impact business and people’s wants exponentially, but whatever the case, history of movements excites me. Thanks to this, I was absolutely enraptured when I learned about the early 1800s and how many movements were being created and expanded during this time. The short lists includes abolitionists, the temperance movement, prison reform, and woman’s suffrage, although there are many more, and many just as interesting. What I find extremely interesting about these movements is how interconnected they are. For instance Catherine Beecher fought for education reform, while her sister, Harriet Beecher Stowe, helped publicize issues with slavery. Dorothy Dix was involved with prison reform, reform that focused especially on mentally ill patients, bringing new issues to light over how patients were treated. These three influencers are also all women, and by having women in public roles bringing change, the women’s rights movement was advanced as well. I love being able to see how everything done in society affects other aspects of it. While current events in today’s time are certainly impacting other nations and policies, it isn’t until we go into the future that we can fully see the results of these actions. Being able to see the web of movements throughout society, and how it impacted other movements, as well as history as a whole, is utterly fascinating to me. A timeline that overlaps so thoroughly makes me curious about each individual event/movement/person, and how history as a whole is impacted due to each change. I’m always interested in discovering the next person, place, or event that will spark my interest, that will continue my love with history. The next person I’m going to look into is Andrew Carnegie. While the American Industrial Revolution never really interested me, I remember finding Carnegie fascinating. I don’t remember much, but I recall that he donated a significant amount of his fortune in his last years, and, my favorite fact, that he offered to fund the Philippines’ independence from the government as he was staunchly against colonization. I am interested in getting more informed about what seems to be an unique figure in history. Thankfully I own David Nasaw’s biography on Andrew Carnegie (appropriate titled “Andrew Carnegie”) which was described as being one of the best biographies on Carnegie. If any of you reading this have any suggestions on what topic I should explore next, please suggest something for me in the comments! This entry was posted in History and tagged abraham-lincoln, zelda-fitzgerald. Bookmark the permalink.